It was with great pleasure and anticipation that the Wired team from Drake Music Northern Ireland’s Belfast hub accepted the opportunity to perform as part of the Arts And Disabilities Forum’s excellent festival, Bounce. 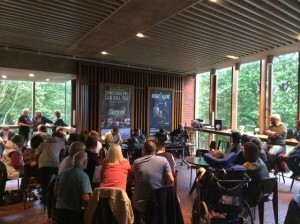 The mission, as we chose to accept it, was to give a live performance in the Bar area of the Lyric Theatre on Friday 4th September 2015. It was an interestingly timed invitation from ADF to the Wired crew, as only the week before the group had disbanded for the August holidays. Well that idea went out the window as all of the musicians and associate musicians rose to the challenge with a mighty Yes. The performance itself was decided on being a showcase of the work of the last six months. Three pieces of recently composed music were decided upon by the team. One titles “The ego has landed”, the two other pieces were untitled. In order to create a live interpretation of the chosen music, the compositions were divided into their tracks, and put into scenes. This was Associate Musician Daniel Todd’s first foray into live music using Ableton Live Software, quite different from Cubase which he used to sample and sequence the tracks with the Wired ensemble. Ableton is perfect for this kind of performance, and its versatility allowed the performing musicians to interact with the programme in various ways. Using a mixture of Ableton Push, a powerful tool designed specifically for Ableton Live, and an I Pad using the “Chordian App” software, Mary Louise was able to trigger sections of the performance, and to add a live element of touch-screen instrument manipulation on the Ipad. Philip was able to trigger scenes from Ableton using his Akai mpd26 . Philip acted as the master controller who had the power to change the dynamics of the overall sound, altering the audio filters and channel volumes within the master mix. A combination of the Akai pad to trigger elements of the songs, and the Soundbeam sonic triggers, Tim controlled elements of the flow of the music with a live instrument manipulation using the sonar properties of the Soundbeam. For those not familiar with this equipment, the Soundbeam allows an individual to manipulate sound using a sonar microphone. This microphone converts the echo location properties of the user into midi date, which is then used to play a virtual instrument. A corner of the Lyric Bar was given over to the Drake Music NI’s Wired project, the Lyric kindly loaning the musicians a Yamaha speaker which boosted the sound levels within the space quite admirably. An initial audience of 40 folk who attended the presentation swelled to over 200 as more people arrived to see the Dancing at Lughnasa performance at the Lyric, receiving a surprising pre-show entertainment from the Wired ensemble. The 3 musicians made sure that they repeated their music just so this new audience could appreciate their skills in composition and performance. Drake Music Northern Ireland would like to thank the Bounce Festival for their invitation to perform. Here is a link to the Bounce festival on the ADF Website. “I loved the performance and was so glad we’d been able to make it happen”.